Do you have kids, nieces, nephews, grandkids or even know any kids in grades K-3?? 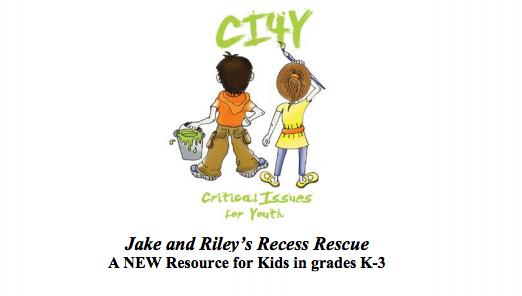 Check out this amazing, new resource for them — Jake and Riley’s Recess Rescue. This coloring/activity book teaches character education and helps young children deal with issues of bullying, interpersonal conflict, power dynamics, and ethical decision-making. There is even a FREE parent/adult guide that comes with it. Best part of all: It was created by one of my friends and leaders in the anti-bullying field – Alison Trachtman Hill of Critical Issues for Youth. Follow this link to get your copy now – http://saj.cc/CI4Y-Jake-Riley-Recess-Rescue – and please help spread the good karma and share this post with your networks, too! Previous Post: « New Sleep Study: Sleep Patterns Determined By Food Intake! Where Do You Fall?